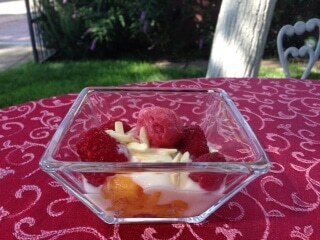 Use fresh peaches now in season in a delightful Peach Melba Fruit Cup. Ripe peaches smell wonderful and are slightly soft to the touch. If your peaches aren’t ripe, put them in a paper bag, close it, and keep them in the bag for a day or two. Watch carefully–it’s easy for the peaches to get too ripe quickly! To peel peaches easily, fill a narrow deep measuring cup with boiling water. Cut an X in the end of the peach. Drop it gently into the boiling water and leave it for several minutes. Remove from the hot water and let cool. The skin should peel off easily. Put the peach pieces in a dish. On top of that layer a generous scoop of vanilla yogurt, raspberries and toasted almonds. Top with a small scoop of raspberry sorbet. * to peel peaches easily, score an x on the bottom of the peach and put into a deep narrow bowl (a 4-cup Pyrex measuring cup works great). Pour boiling water over the peach to cover and allow to sit for about 1 minute. The skin will then peel off easily.